In February 2011 my father and I put out a debate challenge to some of the original Viking team members. The proposed debate would have taken place at the 14th International Mars Society Convention in Dallas, Texas. It was not accepted, but one of the challenged professors (Dr. Andrew Ingersoll) provided specific objections to my report which are listed below along with our responses. Whereas we consider it central to integrity to list criticism and to respond to it, the issues raised by competent authorities are discussed on this page. RESPONSE: The problem with the mechanism of lifting being uncertain relates directly to what the pressure is. The fact that pressure is believed to be so low, when paired with particle sizes estimated to be in the 1 µm range is why Read and Lewis (2004, page 190) estimated threshold velocities for particle life at greater than 500 m/s (1,118 miles per hour). Clearly, nobody believes that winds are moving anywhere near this fast on Mars. If modern science is ignorant about how such lifting can occur at more reasonable wind speeds, then it seems perfectly valid to use the dust devil phenomena on Mars as cause to start the inquiry. All the knowledge gained about lander equipment deficiencies and published in Section 2 (also http://marscorrect.com/photo2_4.html and http://marscorrect.com/photo2_5.html) of my Basic Report plus in Annex G to my report including dust filter and air port access problems on all landers, insufficient (or late) testing procedures for Tavis sensors, and ITAR problems that kept the Phoenix transducer designer in Finland from having critical design information related to heat sources and even the number and location of dust filters employed came after we began the thorough review based on the difficulty in explaining dust devil lifting. As such, we believe that this criticism is without foundation. As for occultation data, it is discussed in Section 5 of my Basic Report. FIRST RESPONSE: First, let us look again at the text and Figures in question from Section 2.1 of my Basic Report. 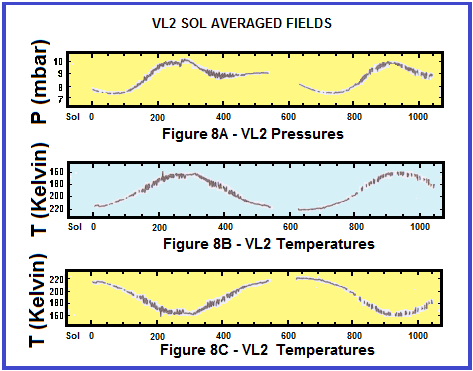 Perhaps most striking is what happens when there is a close examination of two graphs that sum up Viking-2 sol averaged temperatures and pressures. Figure 8A and 8C show that as pressure rose, temperature fell. To counter falling temperatures, RTGs kick on to maintain internal temperature stability. As this occurs, air trapped behind any dust clot would experience a pressure increase. When the Figure 8C graph is inverted and displayed as Figure 8B, the temperature and pressure graphs are nearly an exact match. The biggest discrepancy is after a hiatus with no data between Viking 2 sols 560 to 633 (Ls 68 to 100 in Martian spring to summer). An audit of the data showed that VL-2 pressure readings were often stuck for anywhere from 10 hours to six days (see Annex C for stuck pressures for VL-2 sols 639 to 799). Note that when pressures were stuck, temperatures were not. Figure 8A to 8C: Graphs shown as Figure 8A and 8C are redrawn from Tillman and Johnson. Figure 8B inverts the direction of temperatures on the Y axis to show how heating by RTGs to counter increasing cold outside produces a curve very similar to the pressure curve. * Originally JPL published a pressure of 7.05 mbar for Sol 1 at Ls 150, and 7.18 mbar for Sol 9 at Ls 155, however they later changed these pressures to N/A. VL- 1 and VL-2 data from http://www-k12.atmos.washington.edu/k12/resources/mars_data-information/data.html. Since there is no ocean on Mars to slow the time of maximum cooling it would seem like the coldest time in the southern hemisphere would be at Ls 90, yet we see that minimum pressures can occur over 65 degrees later as Mars moves through its 360 degree orbit of the sun. If the minimum pressure seen by VL-2 at Ls 155.393 is correct, that’s less than 25 degrees short of spring in the southern hemisphere at Ls 180. Frankly, we think this is a pretty lousy fit to the idea of carbon dioxide at the South Pole driving the pressure cycle. RESPONSE: Please provide the math to support your statement. RESPONSE: By scale height, the base of these storms at over 17 km above aeroid should be about 1.17 mbar, and if they go up another 15 to 30 km, then pressures would fall to somewhere between 0.29 mbar and 0.07 mbar (based on a 10.8 scale height if that holds so high). The “others” must be specified. We cannot address vague charges, however at some point common sense has to come into play. Certainly there would be no possibility of annual spiral clouds of this magnitude over a virtually airless world like our moon. So, at what point (and why) would you calculate the possibility of the appearance of such a weather phenomenon as a storm with a 10-km wide eye wall? For that matter, at what pressure would you expect Barchan sand dunes to start appearing and moving (see this link) and rover tracks to start filling in assuming that the sand grains are comparable to what’s on Earth? Feel free to offer the sand chemical composition and particle size of your choice/most probable. The problem, of course, is that items like rate of formation have to be linked with wind speeds (which are uncertain), air density, and particle composition. So, it’s complex – but all the more so if the pressure is off due to persistent clogs on the landers. RESPONSE: This would be absolutely true if the average pressures derived from the Vikings were based on legitimate data derived by pressure transducers that were not cut off from the ambient air by dust clots. But the figures that are used to compute the averages must not be suspect. That, however, turns out to be a very wrong assumption, and the proof this assertion is well documented in the Annexes of our report. My father and I performed an intense audit of the VL-1 and VL-2 pressure data. It seems to be highly flawed. Look at Annex C and Annex D to see how often the pressures were stuck at a given value, not shifting despite enormous changes in temperature (like up to 100 degrees Fahrenheit at times). An example of a page from Annex C and another example of a page from Annex D are shown next. Below: Sample page from Annex C showing no pressure change measured by Viking 2 despite a drop in temperature by 55.89 degrees Celsius (100.602 degrees Fahrenheit). Below: Sample page from Annex D showing many pressure changes less than the ability of Vikings to accurately measure due to digitization of pressure data and a 0.088 mbar pressure resolution capability. 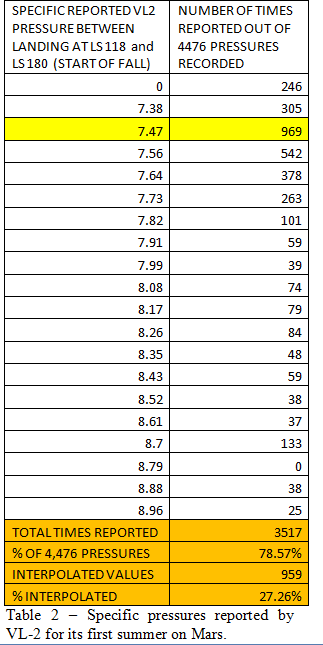 We KNOW about the problem of Viking pressure reports and digitization, highlighted on Table 2 on page 17 of our Basic Report (the Table is shown below). The resolution was only 0.088 mbar. Yet often pressure changes much less than this were shown (see Annex D example shown above) and other times the pressures would just jump or fall by about 0.09 mbar. The choice of how to present the data was not always consistent. The Annex D sample shows not only stuck pressures, but also pressure changes advertised by the Viking Project that were much smaller than the ability of the Vikings to broadcast back to Earth. If we just look at the pressure difference between the two landers, yes the pressure differences are in line with the altitudes of the landers. The problems only become apparent when the pressure data gets color coded. This is what the 52 pages that comprise Annex C are all about. Note that we indicated in pink when pressures got stuck at the .86 time bin (about half the time that they got stuck for at least 5 time bins for the period singled out in the Annex). Why would the pressure guage get stuck at one particular time of day so often? In yellow in Annexes C are the times when the pressures were stuck for over 1 sol. For example, it was stuck (as in partially shown above) at VL-2 at exactly 7.47 mbar from sol 700.5 through sol 706.46 despite simultaneous temperature changes from -24.6° C to -83.17° C. This almost certainly must reflect a malfunction with the pressure measurements, yet there is no evidence that these malfunctions were reflected in average pressure differences measured by the two Vikings. Table 2 from page 17 of our Basic Report. The resolution was only 0.088 mbar. Often this resulted in a pressure changes recorded of about 0.09 mbar. INGERSOLL'S SIXTH CRITICISM: There is a lot of uncertainty about how dust is lifted from the surface of Mars, but a higher surface pressure is not the answer. Different methods agree within a few percent, so the surface pressure is well known. You would be better off trying to understand the mechanisms of dust lifting than trying to dispute the pressure measurements. RESPONSE: So long as there is uncertainty, which goes with the nature of the universe, there is reason to question. Different methods to explain lifting does not mean that any of them are right. The low pressures do not easily or all explain the weather plainly seen on Mars. The fact that different methods for lifting agree within a few percent may mean nothing more than the fact that scientists are desperate to come up with models that justify bad data. This is like what we saw in history when so many people tried to come up with fancy ways to prove that the sun and planets circled the Earth. Their predictions may have been correct, but the fundamental beliefs were totally wrong. RESPONSE: Mars Pathfinder had the same (flawed) Tavis transducers as the Vikings had. Suppose we want to measure temperature. We have 2 thermometers - both from the same factory where a drunken worker labeled them as Fahrenheit when really they measured Celsius. We send them off to Mars, and they agree on the temperature. But they are wrong. Now we go back to the same factory and grab a third and send it off to Mars too. Lo and behold, it gives the same temperature. But it's still dead wrong. So with the Tavis transducers sent to Mars. Problems with Tavis transponders are addressed in detail in my report. INGERSOLL'S SEVENTH CRITICISM CONTINUED: ... and Phoenix as well. The instruments on both Mars Pathfinder and Phoenix have calibration issues related to temperature variations, but all four sets of pressure measurements are mutually consistent at about the 1% level (after accounting for differences in surface elevation). It's very hard to believe that all four sensors could be biased in precisely the same way, so as to give the same wildly wrong answer. Here are a couple references. RESPONSE: Thanks for acknowledging the calibration issues. Your first link to the Pathfinder pressure measurements will be discussed more on a separate page at http://davidaroffman.com/custom3_33.html. However, your first link mentions wind speed calibration problems. They were never solved by the Pathfinder team. I believe that their failure was likely caused by the failure to get the pressure right. This is discussed in Section 7 and 7.1 of my Basic Report. Three of the 4 missions you mentioned used the same Tavis transducers. So the real issue is with respect to why the Phoenix had similar figures. It helps to understand what problems are known about the testing, deployment, and data interpretation for these sensors. Here a quick idea of some of the problems encountered can be gained from Section 2 (and its subsections) of my Basic Report. Certainly all the landers were subject to dust ingestion on landing. NOTE: The following comments were written by me based on a 2009 Draft of the same paper that was just given as a link for Phoenix pressure measurements above at http://www.agu.org/journals/ABS/2010/2009JE003422.shtml. With the interpretation of the data back on Earth I believe a real effort was made to make the data fit in with what was previously believed. The reason that I say this is that in the Abstract of ON PRESSURE MEASUREMENT AND SEASONAL PRESSURE VARIATIONS DURING THE PHOENIX MISSION (Oct. 2009 Draft by Peter A. Taylor et al.) it states that, "the original data processing routine had problems because the thermal environment of the sensor was subject to more rapid variations than had been expected. Hence the data processing routing was updated after Phoenix landed." They pointed to inaccuracy caused by unit temperature rises above 0° C in the afternoons. The paper includes plenty of phrases like, "We presently have concerns about the accuracy of our pressure data on diurnal and semidiurnal time scales and can only present preliminary results." The importance of what happened to the data after it got back to Earth is apparent from their remarks that, "Calibrated pressure readings are calculated after the data are transmitted to Earth.... The reason why the raw pressure data readings calculated onboard differ from the actual calibrated readings is associated with a lag of actual Barocap temperature relative to that reported by the Thermocap because of differences in thermal contact." Now, all this does not prove any kind of deliberate effort to fudge results. But it does show the complexity of what was attempted. However, when "calibrating" readings, there would be a natural tendency to try to make the final data fit in what what was known. There were many caveats in the Taylor et. al (2009 Draft) paper about how the data was collected for Phoenix. If Phoenix was not designed properly, we're back to three Tavis transducers - and the one on Pathfinder only functioned for less than 3 months (July 4th to September 27th, 1997). So, in terms of annual pressure changes, we only have the two Vikings - and as has been shown above, their pressure data was certainly flawed by great periods of no pressure fluctuation depite wild swings in temperature. In short, the biggest problem is that the pressure data does not explain the weather seen. It’s like turning on the TV, seeing a report that it's sunny and clear outside, only to look out and see a tornado or hurricane raging (which is, of course, no where near as big as a global dust storm). The questioning of the lander pressure data was not a flippant decision. In addition to the year required for me to largely finish the Basic Report, the formatting of the Viking Project data for our Annexes was almost a full time job for my father (undertaken between my Mars speech in Dayton, Ohio last August 5th, and the end of my junior year at Embry-Riddle in December, 2010). It could not have been done without my MATLAB skills, but I could not have done it myself because I was after all, a full time student, with a 3.635 GPA. The ongoing project is a team effort between my father and me. Concerns about our findings, suggestions for improvement, etc. should be sent to both of us. My e-mail address is DavidARoffman@Gmail.Com. You can reach my father, Barry S. Roffman, at marscorrect@gmail.com.